Bake a sheet cake the size that you will need. Make buttercream icing. With an icing filled bag and round tip, size #5, draw the number one on the sheet cake. Then draw the fairy over a section of the number one (refer to the picture). The blue flowers below the fairy’s arm should be where the edge of the cake is. The rest of the fairy’s dress is made by using pieces of the cake that will be cut out when you cut out the number one and the fairy. Now, cut out the number one and the fairy. Make light flesh colored icing. Using star tip, size #18, fill in the fairy’s face and arms. Do the eyes and smile with black icing and round tip, size #3. The hair is done using yellow icing and star tip, size #18. The crown is done in blue icing and star tip, size #18. The star on the crown is done with white icing and star tip, size #16. Next fill in the dress with green icing and star tip, size #18. Using blue icing, the same as you used on the crown, and star tip, size #18, make the blue flowers on the green dress as shown on the picture. Using yellow icing and round tip, size #5, place a small dot in the center of each blue flower. Cover the side edges and top edge of the number one with a dark pink icing and star tip, size #18. Fill in the number one with a lighter pink icing and star tip, size #18. With white icing and round tip, size #5, draw a wand in the fairy’s hand. Finally, with yellow icing and star tip, size #16, make the star at the end of the wand. The message can be written on the board using dark pink icing and round tip, size #5. 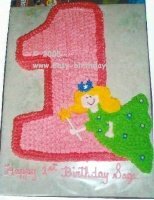 Although, you always want your 1st birthday cakes to be extra special, they don't have to be hard to make! Here are some other 1st birthday cakes that you may also like.